the 28-foot RB-S is powered by twin 225-horsepower (hp) Honda outboards. Louisiana Manufacturer will Replace Coast Guard's Small Response Boat Fleet. 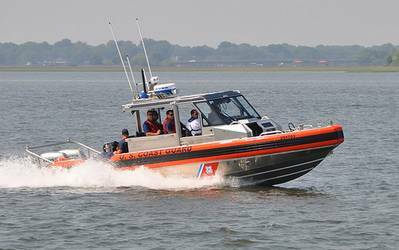 Metal Shark Boats has been awarded a contract to replace the U.S. Coast Guard's fleet of Response Boat - Small (RB-S) vessels. Up to 470 boats will be delivered across the Coast Guard fleet, with an additional 20 boats will be available to U.S. Customs and Border Protection, with another ten slated for purchase by the U.S. Navy. The $192 million contract is one of the largest boat buys of its kind for the Coast Guard, and provides a significant economic boost to the state of Louisiana. To better manage the increase in manufacturing requirements, Metal Shark plans to expand its 65,000-square-foot manufacturing facility in Jeanerette while increasing its production team of skilled aluminum welders, rigging and electronics experts, and installation professionals from 80 to 120 employees over the next six months. Based on Metal Shark's exceptional Defiant platform, the 28-foot RB-S is powered by twin 225-horsepower (hp) Honda outboards for speeds exceeding 40 knots with a minimum range of 150 nautical miles. RB-S meets all Port Security Grant requirements and is ideally-suited for port and waterway enforcement, search and rescue operations, drug and coastal interdiction, environmental and other law enforcement missions. The boat is road transportable for service between missions, and may also be transported via C130 aboard a specialized trailer. RB-S also includes a full complement of communications and navigation gear, as well as shock-mitigating seats for enhanced crew comfort. The crew is further protected from foes - and the elements - by a fully-enclosed cabin enhanced with ballistic materials. The vessel's side and rear windows drop down to improve crew communication and ventilation. RB-S is also weapons-ready, with multiple weapons racks and an integrated weapons-ready mounting system at the bow. The forward-mounted gunner's platform provides 180-degree firing capability while a pass-through hatch leads to the cabin for easy access in any conditions. LOA: 28' 6" Beam: 8' 6" Draft: 1' 8"
Metal Shark sells directly to qualified government and commercial organizations, and custom-builds all boats to mission specifications. Metal Shark products are also available for purchase using General Service Administration (GSA) Supply Schedule 084. GSA pricing is also available to State, County, and Municipal agencies qualifying under the 1122 Counterdrug Program. A subsidiary of Gravois Aluminum Boats, LLC, Metal Shark offers a dependable lineup of CBRN, law enforcement, military, fire/rescue, and commercial vessels ranging from 16 to 65 feet. Metal Shark's all-aluminum construction provides a solid, durable, and low-maintenance platform built to withstand extreme conditions, harsh environments, and years of abuse.